Skila Brown is the author of the young adult novels Caminar, a School Library Journal Top 10 Latino Book of 2014, and To Stay Alive. Slickety Quick is her picture-book debut. Skila Brown lives in Indiana. Bob Kolar is the author-illustrator of Big Kicks. He has illustrated numerous books for young readers, including AlphaOops! The Day Z Went First and AlphaOops! H Is for Halloween, both by Alethea Kontis, and Nothing Like a Puffin by Sue Soltis. Bob Kolar lives in Missouri. 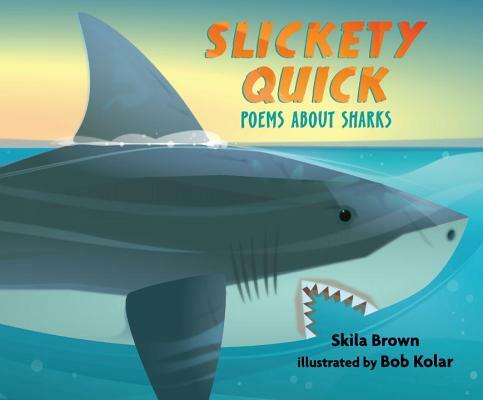 These concrete poems about a selection of sharks will tickle the fins of many an aspiring marine biologist...The digital illustrations, glossy and brightly colored, are just cartoonish enough to dispel any fears young readers may have about the subject. Brown begins this playful and illuminating collection by taking a bite out of the most infamous of these ocean predators, the great white shark...This book offers an accessible and engaging appreciation of these fascinating creatures. Pair with Nicola Davies’s Surprising Sharks (rev. 1/04)…though maybe not at the beach.